Here’s a reality check: 54% of meetings now involve a remote worker. Whether you need to connect with a colleague, client, or supplier, remote collaboration has become an essential component of daily work life. And it’s not going to change. WHY IS INVESTING IN YOUR COLLABORATION SPACES CRUCIAL? • Millennials are innovative by nature and expect the organization to support them. • They expect a variety of office spaces and the ability to use technology in them all. • Millennials vote with their feet, 58% change jobs in less than 36 months. • Retaining Millennials is becoming a huge priority to organizations. • Millennials expect work technologies to support modes of working. • They are the 1st digital native generation. • 9 Of 10 Millennials identify flexibility that supports their technology as a top priority. • The majority believes their personal devices makes them more productive. Undeniably the landscape is changing and organizations must adapt… and quickly. Technology and collaboration require the seamless integration of people, space and information which can be a daunting task. 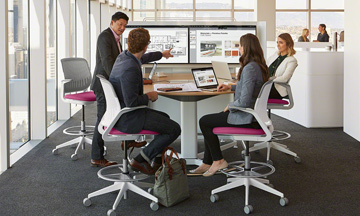 So, what are the next next steps when looking to improve the collaboration spaces in your workplace? We already covered most of this but it will help if you remember a few key things….This group checks their devices 37 times an hour, 80% sleep with their devices and this group tends to work the way they live. Technology must be seamless, intuitive and everywhere! Especially in settings that well… feel like home. Workplace design has changed, the majority of people work in an open plan environment. Spaces and technology should support mobility, content creation, digital content on demand and different workflows (analog and digital). This one is simple. Choose the most streamlined, intuitive and user friendly solution you can afford. In the end, the higher rate of adaption and lower user frustration will pay dividends. Ask what they need and then solve their problems. You will be a hero! 5. 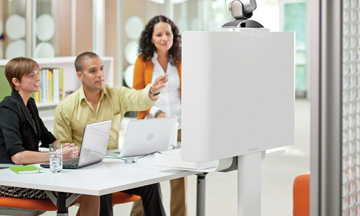 Consider how technology is integrated into the space. It’s not just about setting up a video conference anymore. It’s about meshing audiovisual technology with the space to streamline the total experience. Can your system bring in content from the cloud, automatically configure the necessary resources, schedule the room and initiate calls through the video platform, or configure the lighting and sound in the room. These are all incredibly powerful capabilities readily available today.